Thanks Jimi Festival" 1st of May - WORLD GUITAR DAY !!! Founded in 2003 by Polish guitarist Leszek Cichonski, the "Thanks Jimi Festival" has taken place annually in the Rynek (Old Town Square) of the beautiful medieval city of Wroclaw, Poland. 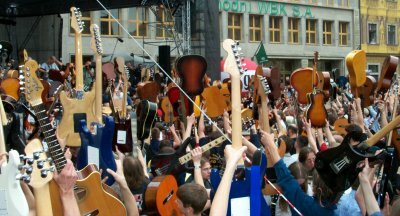 The "Thanks Jimi Festival" has grown into the largest guitar event in the world after securing the Guinness World Record for the Largest Guitar Orchestra in 2006 with 1,581 confirmed guitar players all playing together simultaneously (and official estimates of an additional 15,000 people in attendance). The event is transforming into the center of an annual 1st of May "World Guitar Day" and is expanding significantly with satellite events happening simultaneously around the world as well as private individuals and smaller groups being able to also take part in real time via the web. 2007 only looks to be bigger than last year's record breaker. We hope you will join us in a day of global, positive creative celebration and a new UNION and solidarity (this is Poland after all...) of guitar. Be a part of making the 1st of May WORLD GUITAR DAY !!! This is a new idea and a spontaneous MOVEMENT - we have fans in some specific 'hubs' (Berlin , Munich, Polish Radio in New York, Brazil, Sweden, Australia, and more joining every day) who want to celebrate The 1st of May - World Guitar Day with us. Some of these groups (and, hopefully, others) will host smaller local gatherings at the same time and webcast those events back to us in Wroclaw and we can show these live (and possibly later in the event) to the crowd in Wroclaw via our large screen monitors. If you want to organize something like this, CONTACT US! We want everyone who wants to take part to be able to. If you want to be a part of it, we want you to be a part of it! We have confirmation from Guitar Player Magazine's "Guitar Player Television" for promotion of this Idea and the event! Help US make the 1st of May - WORLD GUITAR DAY !!! More information and photo galleries you’ll find here http://cichonski.art.pl/eng/record.htm .